As beautiful to behold as it is to play. Suzuki introduces a Mini-Grand Digital Piano that's beautiful to look at and fun for the whole family. A powerful musical instrument, the MDG-330 is packed with features that combine technically advanced performance with traditional elegance and a hand-rubbed lacquer cabinet. Perfectly proportioned, the MDG-330 fits most room sizes and decor preferences. Hundreds of prerecorded music files are available to download to set just the right mood. The MDG-330 is a digital piano that never needs tuning. An amazing combination of 128 voices, rhythms and recording features create endless musical possibilities. 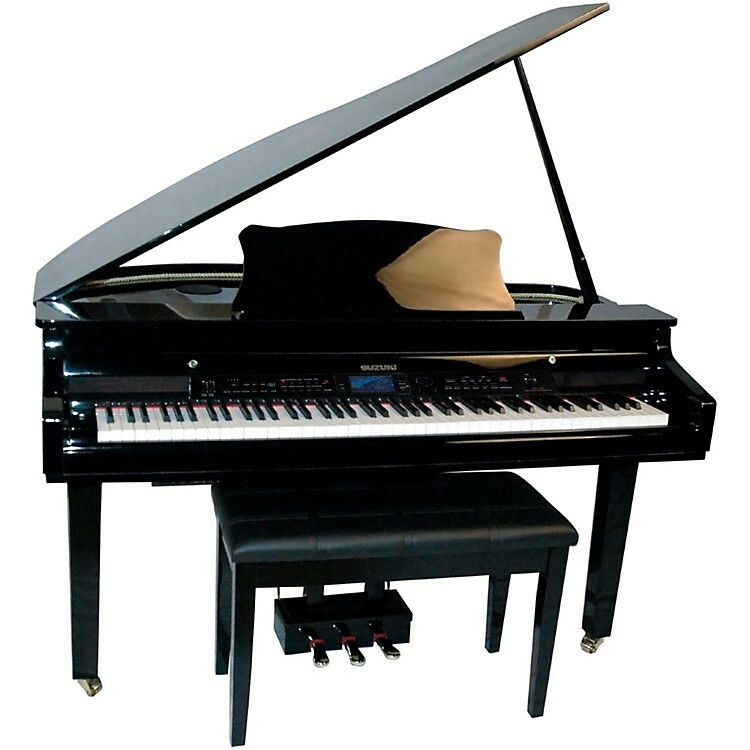 Advanced balanced graded hammer action keyboard delivers authentic Grand Piano touch (teacher recommended) while stereo and 3D instrument voices create astonishing acoustic sound realism. A host of auto accompaniment features include 100 professionally arranged accompaniment styles. Compose and save your own songs with the on board 3 track recorder. Save and play back practice sessions using Secure Digital Drive (SD Memory Card). Suzuki's acclaimed sound imaging technology and 24MB grand piano voice are used to create remarkable depth, expression and realism. Instrument voices use 3D sound source sampling for incredible dynamic response. The MDG-330 features a powerful 6 speaker sound delivery system. High grade speakers and integrated tuned cabinet deliver a truly dynamic sound, rich with presence and power. As a tech titan, the MDG-330 includes the latest Bluetooth technology. Wireless networking enables any wireless device to connect to your MDG-330 Digital Grand Piano for expanded and convenient operation. Connect the MDG-330 to your iPad and convert it into a recording studio! Makes practice and playing time a lot more fun. If you have kids, it might make all the difference in encouraging them to practice. The MDG-330 has a USB port that opens a world of exciting add-ons and extra functionality. Plug and Play directly with your laptop or desktop computers. Or you can use the MIDI ports to transmit and receive data from other musical instruments or computer accessories. The MDG-330 has a velocity sensitive, graded hammer action keyboard that offers superb response and smooth feel. More than just a piano, it's a lifestyle enhancement. Order the MDG-330 today.